What is the energy payback period for solar systems? Home Learning Center Solar panels What is the energy payback time for solar systems? What is the energy payback time for solar systems? The energy payback time (EPBT) of a power generating system is the time required to generate as much energy as is consumed during production and lifetime operation of the system. The past decade the energy payback time for solar PV systems has been reduced drastically. Due to improving production technologies the energy payback time has been decreasing constantly since the introduction of PV systems in the energy market. In 2000 the energy payback time of PV systems was estimated as 8 to 11 years and in 2006 this was estimated to be 1.5 to 3.5 years for crystalline silicon silicon PV systems and 1–1.5 years for thin film technologies (S. Europe). These figures fell to 0.75–3.5 years in 2013, with an average of about 2 years for crystalline silicon PV and CIS systems. Over the past years, manufacturers of silicon wafers have been able to reduce the thickness of the wafer and therefore reduce the costs of the solar cell significantly. One enabler for thinner wafers are the automatic soldering machines, which put a lot less pressure on solar cells than manual soldering. 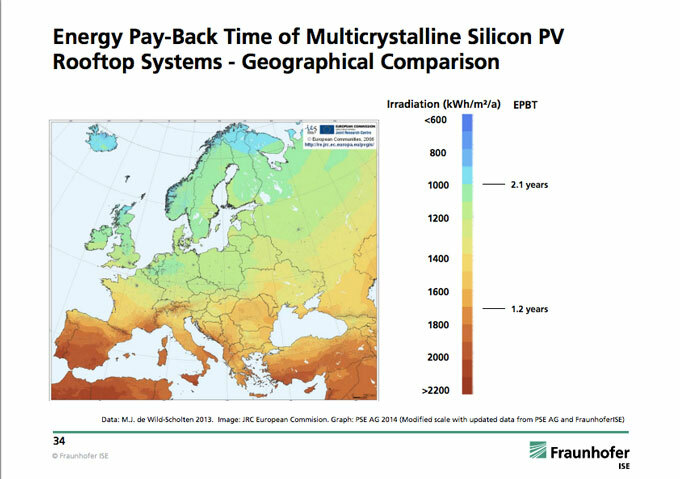 As you can see from the handy Fraunhofer over ‘Energy Pay-Back Time of Multicrystalline Silicon PV Rooftop Systems’ below, the energy payback time in Europe varies between approximately 1 and 2.5 years. The energy payback time in Northern Europe is 2.1 years compared to 1.2 years in Southern Europe. 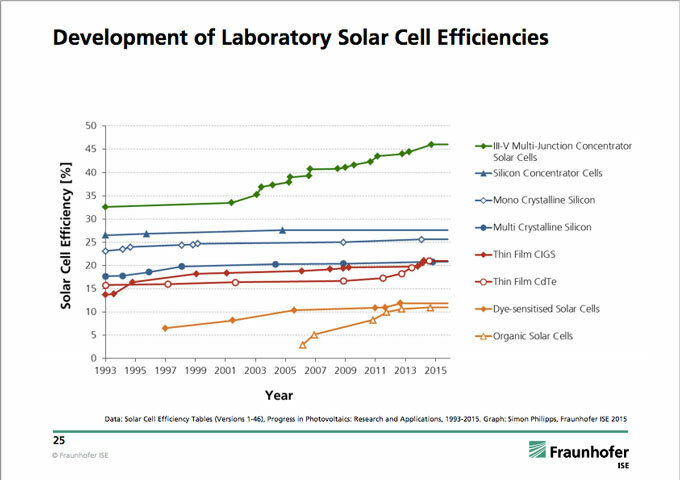 If you want more information on this topic, have a look at the The Fraunhofer annual Photovoltaic Report. It has excellent data on energy payback time. You can download the 2015 report here. Great info. What is the EBT if the solar panels are recycled?